About a year ago, I connected online with a very talented young lady – a teacher in Taiwan who is well-known on social media for her sharing and passion for education. May I present: Annie Tsai! 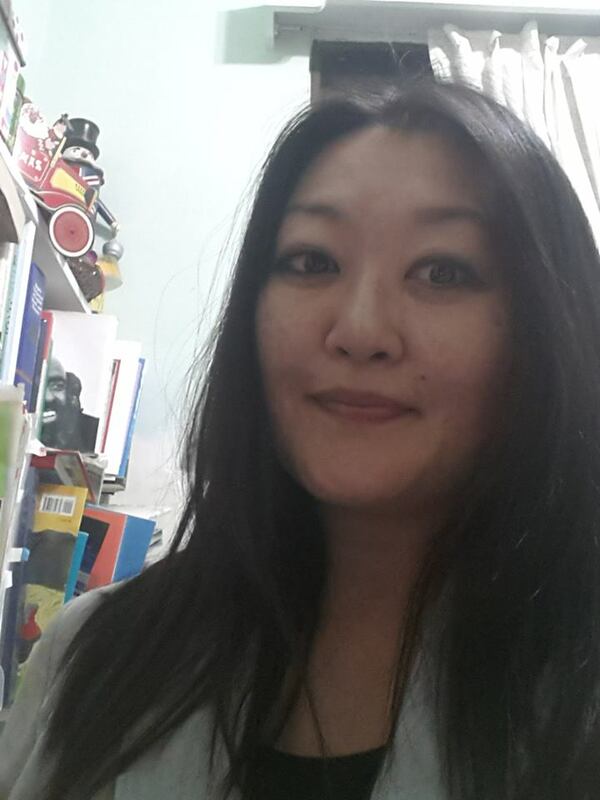 Annie Tsai had worked for a few radio stations as a copywriter but later on changed her career as an EFL teacher. After being in the same position for 9 years at a public elementary school, she decided to make a change again and she’s currently a 3rd grade homeroom teacher. She’s based in Taiwan but always on the track of going somewhere overseas. Other than being involved in local teacher’s training program, she’s also passionate in backpacking and trying her best to bring the world to her class. She has won a scholarship from Cambridge Global Teacher’s Essay Competition and she was also the winner of 2011 Everybody Up Global Sing-along Competition sponsored by Oxford University Press. Vicky: Annie, I am so happy you have accepted to be interviewed on my blog. We have never met in person, however, from our connection on social media I have seen all the great things you do in your teaching and that is a huge reason why I wanted you to share everything with us! Annie: Thank you! I have enjoyed seeing your side of the world via FB. I think this is one of the best parts of being connected via social media. 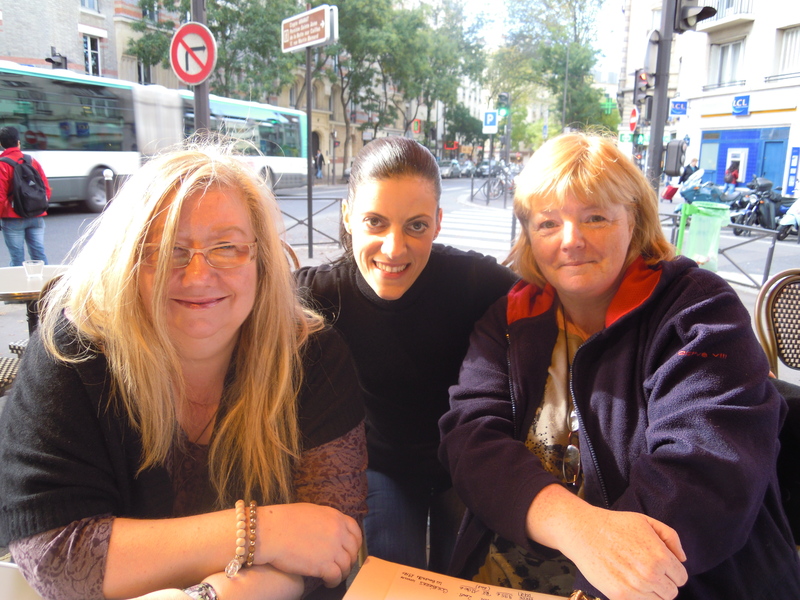 A group of people, albeit never met in real life, share the same passion and profession, which is the living proof of why learning a foreign language makes us a better person in so many levels. We learn to share and communicate and our perspectives can be so much more versatile in this way. It helps to have a clear mind, especially for educators joggling between teaching and management. Vicky: How true! Let’s start with something I ask everyone I interview – because it is so interesting to see their journeys entering education. How did you decide to join this field? 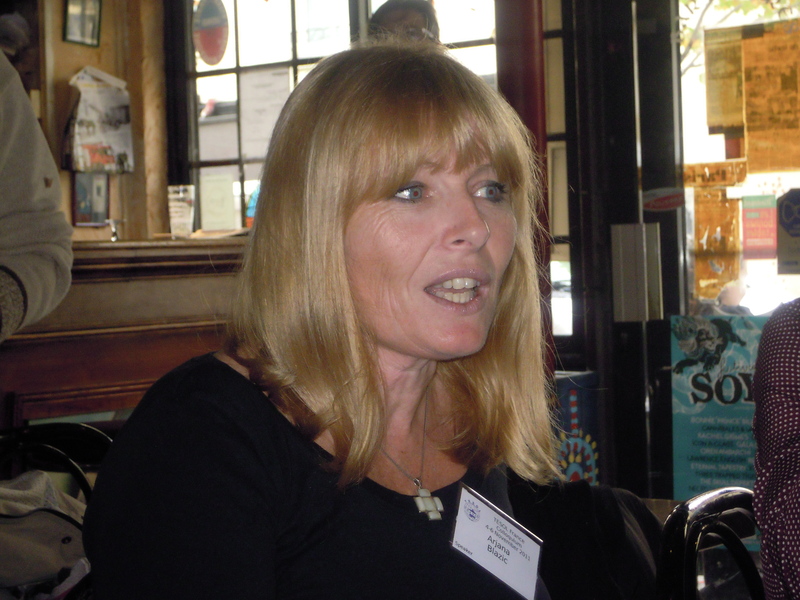 Annie: I had worked as a copywriter/planner at a couple of radio stations before changing lanes. In my last year at the media industry, I did some serious thinking of my future if I should continue to stay on the same path. That was the same year when the Taiwanese government decided to start the English education from elementary level. With my mom’s strong suggestion, I took the entrance exam they held and passed with flying colours. Thinking back now, it is a life-changing opportunity I hadn’t expected, considering my childhood memory with school wasn’t that rosy and shining. I have to admit that becoming a teacher is the most rewarding and best decision I’ve ever made in my life. It makes me learn more about my strength and weakness. It is the kind of profession that makes you examine your personality and rationale in fairly frequent bases. As a person who had spent the better half of her career life in the media industry, I think it is fair to say that I’ve seen the scenery from both sides. Teaching is a highly self-motivated trade and it is more than often being misunderstood or underestimated by the public. Teaching, however, also brings undescribed joy of reward for numerous people. The longer I stayed in this profession, the more I realized that teachers can play far more important roles in the mini-society they walk in every day. Changes that last for a lifetime may start from a classroom. Vicky: Wow! What an interesting journey. And in your teaching career so far, you teach Young Learners. What do you enjoy the most about these ages, and what are the challenges? Annie: Ah, the possibilities there can be and the generosity they can offer is the most important present and privilege a teacher may receive! I love helping these little people to learn the world as I know and knowing that the world is so big that every one of us might see only a fraction of it. The only way to learn the world is to see it in your own eyes. Thus it is a joyful achievement if you get the key to communicate with people from other parts of the world. Often times my young learners surprise me in cute yet awkward moments. Here’s an example, being neighbored with an Air Force base means we all get used to the helicopter noise. At the beginning of this semester, several days after we covered the word helicopter, my children shout the word a few times during the class whenever they heard the whirling noise. Now of course I was a bit annoyed with the interruptions, but at the same time, it was such a memorable moment to see how they were so proud of themselves and they’ve made such a positive and strong connection with the foreign language. The challenges are always there but they can be presents as well. Since Taiwan is an EFL country, it is almost impossible to have sufficient and positive English exposure once pupils leave English class. And the education policy in regards of foreign language often fails to meet the needs of real teaching scenes. During my prior 9-year stint as an EFL subject teacher, I see my students twice every week, with only a 40-minute block in each session. Without effective and extensive schemes to help these young children to review the content, the language material can hardly sank in their brains. To make things harder to manage, classes always come in diverse abilities and I usually have around 300 students to teach annually. 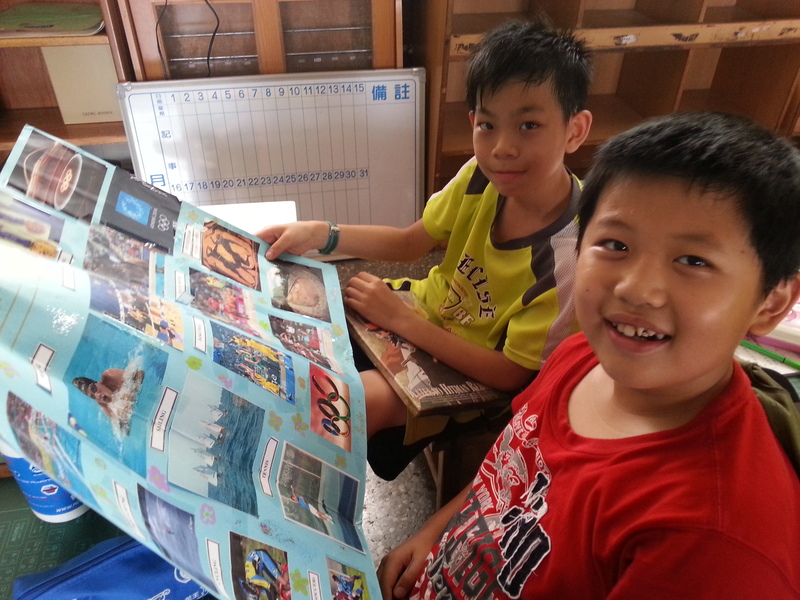 The English teaching industry has always been an issue in the spotlight in Taiwan. It is true that most people found it difficult to master the language to the level of real communication. It is also true that most people still see English as a subject to learn rather than a tool to master. Thus it is common for people to simply give up and steer away from anything related to English once the pressure of tests and exams are out of the picture. So my hope in switching from an EFL subject teacher to a homeroom teacher is to expend the horizon of teaching a foreign language. I believe that by planting the seeds in the earlier stage can motivates them to make an effort of keeping the language. Eventually it may trigger their minds in exploring the world years later. Finally, I’d like to share that the difficult teaching context may be inspirational sometimes. You wouldn’t try so hard to adjust and adapt if all things are good. That’s also one of the things I love about teaching. It is a comparatively secured profession in making renovations. Vicky: That’s a beautiful statement you just made. And thank you for sharing your experiences with your young learners, and giving us some insight into the EFL context in Taiwan as well! So interesting. Would you ever consider teaching adults? Have you ever done it? Annie: Oops, sorry, I have very limited experiences in teaching adults. Vicky: That’s fine! Let’s move on to something different now. You share and interact a lot on social media, and that is how we actually got to know each other. Do you think social media help educators, and if yes, how? Annie: I found social media very helpful in regards to connecting and sharing. It’s also a great platform for information and subjective perspectives. 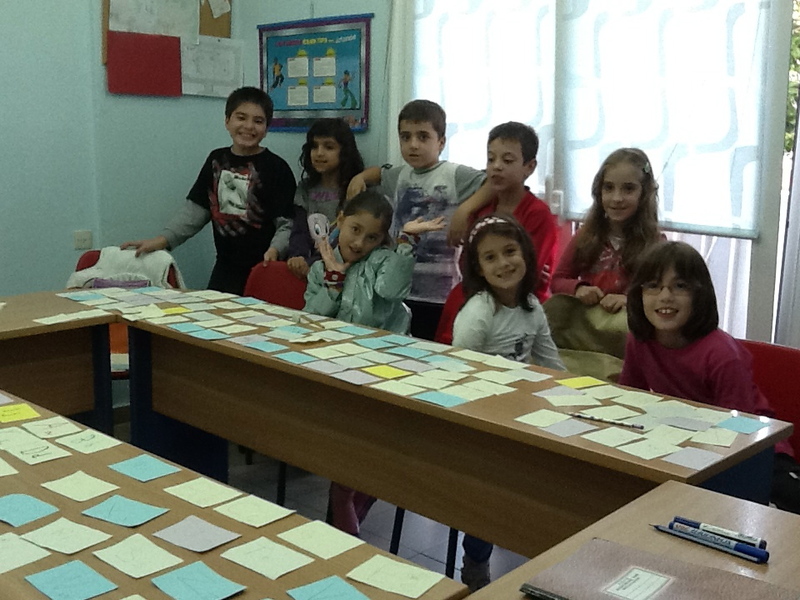 It is especially beneficial for EFL teachers as they often play the role as the ambassadors of each respective culture. Such characteristic broaden the room for thinking and the definition of better practice of teaching. Even in a country as petite as Taiwan, the resources and intel from different corners of the island can be quite diverse. I’ve learned so much information from my peer via FB and it works like therapy groups sometimes! Social networking helps closing the gap between teachers and at the same time it weaves in new threads of thinking to the existing concept. Annie’s kids planning to send materials to Aphro’s kids! To make things more exciting, platforms like Twitter, FB and Pinterest, involves teachers in different time zones and together we get to converse in the comfort of our own sofa. Additionally, professional and independent EFL FB pages such as iTDi also bring in the self-helped professional development courses that I can easily enrolled and learn in my own pace. The interactions performed in these virtual spaces, are more often than not effective and to the point. Perspectives and knowledge are no longer limited in geography. That’s the most fascinating part of all these virtual networking, just like the way I’m doing an interview with you now! Vicky: Isn’t it great? I am thrilled about this! 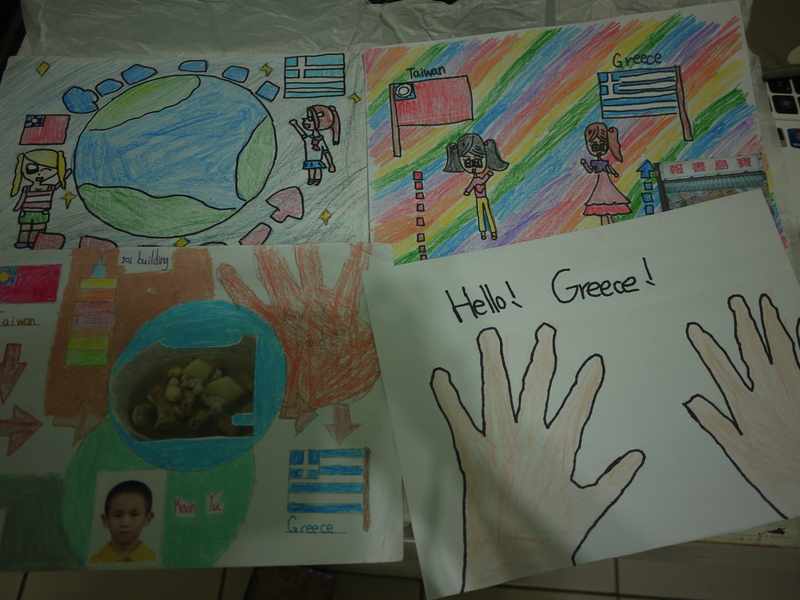 And in addition, you are part of a fantastic international programme – your kids are pen pals with another class in Greece, that of Aphrodite Giouris, who is in Larissa. How did this project start? What do you do? Annie: I came across Aphro via Facebook; I think we have mutual friends and after several chats back and forth, we decided to partner our classes and do a series of exchanges. For my students, Greece is just as ‘familiar’ and ‘exotic’ as those Greek gods and goddess they read in the books. 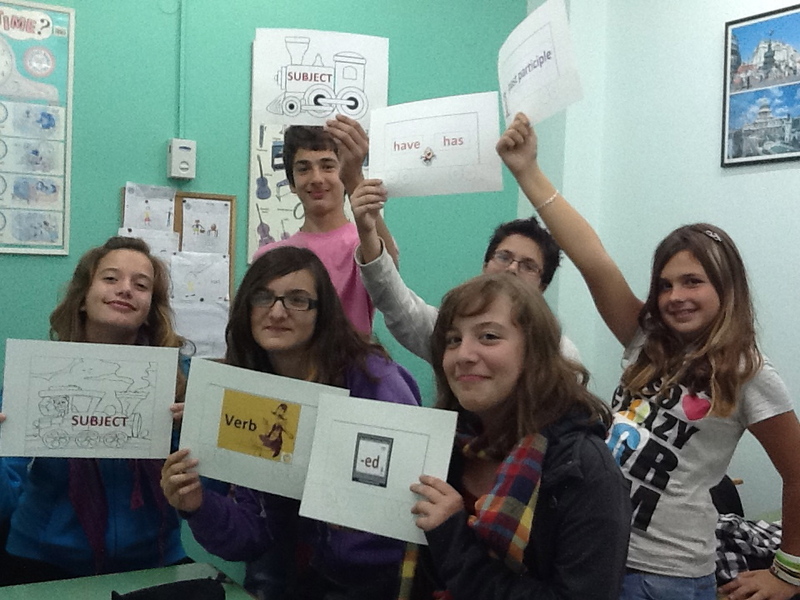 The project enables my children to apply the language with a purpose. They no longer see Greece just another far-away country on the map. It has become very real and intriguing to understand that there are kids thousands of miles away learning the same language just like us. Aphro and I also tried our best to match our kids from both sides and make sure each of them eventually receive something specifically for him or her. The experiences are phenomena as most of them have never received any hand-written letter before, let along anything from a foreign country! I have personally learned and enjoy the process all the way as this project gives me a hands-on opportunity to design an integrated course just right for my class. It’s a great practice to test a teachers’ understanding of teaching material and how to best perform them in the making of the project. Vicky: I look forward to seeing more and how it evolves! It truly caught my interest since day one and think it is a great opportunity for the kids to broaden their knowledge, both in culture and the language. Now to the future: what is one of your dreams about your teaching in the next few years? Annie: As a rookie homeroom teacher, it means that I’ll have to be more familiar with other main subjects such as Mandarin and math. I’d like to take advantage of my new teaching context to build a more integrated curriculum. With more time and fewer pupils, I’m thinking about more shared reading experiences and eventually have at least a class drama annually. I’m also hoping for opportunities such as international competitions/networks to bring my children to the wider communities of the world. As a senior EFL teacher, I’m hoping to organize or being involved in professional development for teachers. I’ve had a few experiences and hoping to continue the journey of sharing. I’m also looking forward to opportunities to brush up my language proficiency and hoping to be able to participate in International EFL conferences. Guess my wish list for Santa is a bit too long ; ) Still, being a teacher gives you the means to make your dream come true. Vicky: It’s been such a pleasure hearing about everything you do! Thanks so much for this wonderful interview, Annie – I hope we meet in person some day! Annie: As a passionate backpacker, I might actually hop on a plane and fly to the picturesque Switzerland some day! Thank you so much for the heartwarming invitation. Merry Christmas and Happy New Year! A couple of days ago, Tyson Seburn wrote about his experiences in his teaching environment in his post What classroom is perfect? I decided to take up his blog challenge – here it is! When we had our school in Greece, we had 11 classrooms – not to blow our own horn, but in each classroom the teachers had all the equipment they needed. The school also had a computer lab and a room with an interactive whiteboard. Therefore, the equipment could be moved easily if needed, or the teachers and their students could easily be moved to the room they wanted to use, easily. We did this out of respect to our teachers and students, to make everyone feel comfortable and content to teach and learn. When I moved here in Switzerland, I started teaching at various places until I could get enough work – in schools, companies, banks – you name it. Some places, had the works as far as equipment was concerned, some were okay in some I had to teach in my coat and gloves (yes, you read correctly). Thankfully, only a couple of places match the last description. An example of an excellent teaching environment is the public college I started teaching at here last year, the Kaufmännisches Bildungszentrum Zug – the admin people, secretaries and teachers are amazing to work with and the classrooms…wow, the classrooms! – 3D projectors!!! I LOVE THEM! A great place to teach – a place that respects its educators and students. Shouldn’t all schools be like this? Some aren’t, understandably due to their restricted budgets, some because the people who own them do not care. Let’s hope we see lots of great working environments in this blog challenge set by Tyson! 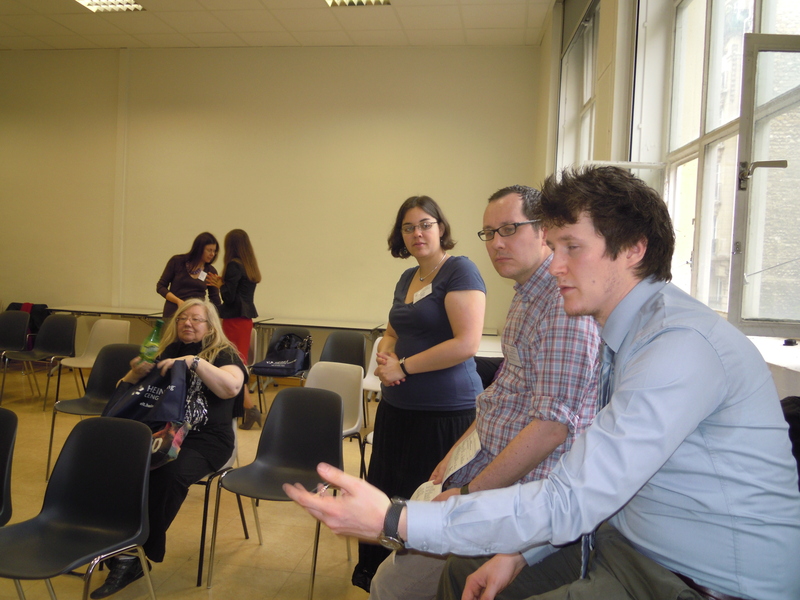 An #ELTChat Summary – What do we do when a lesson goes horribly wrong? How do you cope and recover? 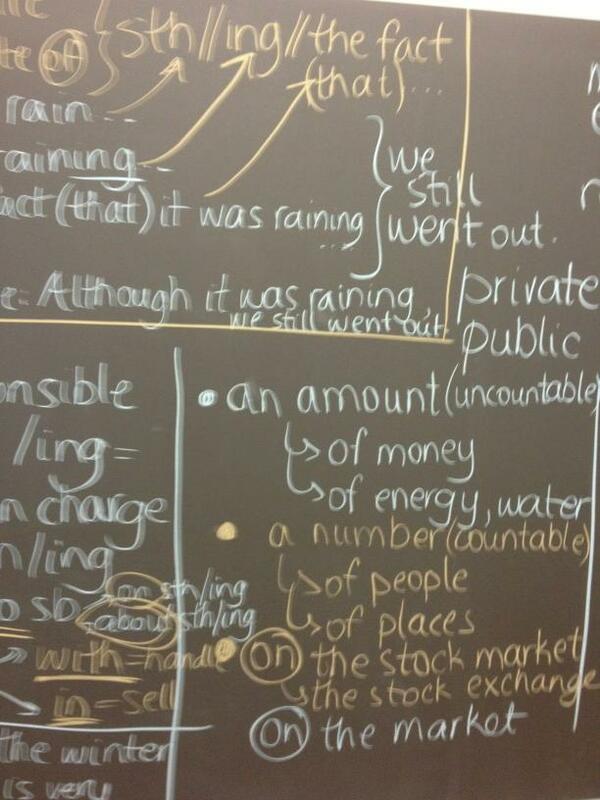 Today’s lunchtime ELTChat was about yet another very interesting topic. It has happened to all of us – a lesson goes wrong, the opposite of what we expected. How do we handle it? What do we do in these cases? – We reached a general consensus that it is better to switch activities and after the lesson, sit down and reflect on what went wrong. It is not advisable to do away with the said lesson plan, but it is even better to adjust/change it, in order to use it more effectively in the future. – It was mentioned that it is a great idea to have fillers up our sleeves to manage in such situations, when something does not work. – It is generally better to sometimes admit in class that something did not work / was not suitable and perhaps even discuss with the students what went wrong / what could be done better next time. – Having the confidence to stop is a great thing; acknowledge an idea is not working and just move on. Keeping yourself calm is also important, as it can be a difficult moment. 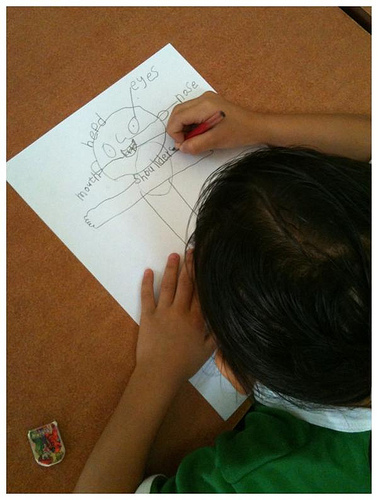 – Leave space to customise for each student / group of stiudents. It is essential to be flexible with our lesson plans. Lessons that do not work can leave inexperienced teachers lacking in confidence. What would we advise them? – That it is okay when a lesson fails – it can prove to be a learning experience. What happened? What was the lesson plan like? Which group were you teaching on the given day? – A bad day can happen to anyone. – Jane and Dave Willis’ ELT Website. – Cybraryman’s Lesson Plans page. I would like to thank Martin Sketchley for sharing this fantastic blog post about his time teaching English in Korea. I have really enjoyed reading this – it is so interesting to see how things are teaching in another country. I love the extra reading list as well! Thank you so much, Martin! 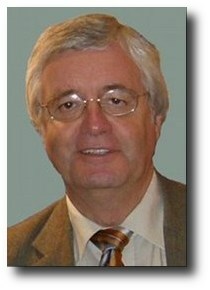 Martin Sketchley has been teaching English as a foreign language for six years. He taught for three and a half years in South Korea for various private language institutes. During this period, he was a BULATS Examiner and assisted in introducing the exam to this region of Asia. 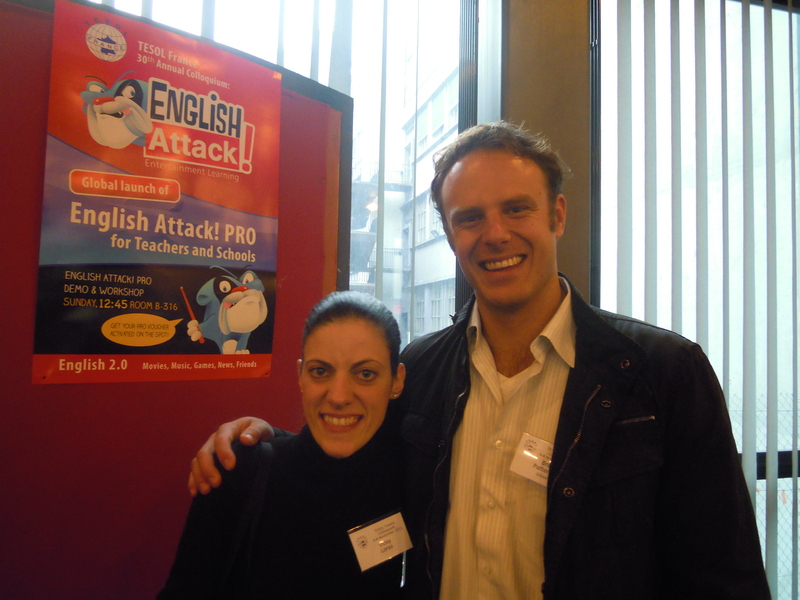 Martin returned to the UK and recently completed an MA in English Language Teaching at the University of Sussex. Currently, he is a Cambridge ESOL Examiner for B1 and B2 CEF level examinations, works at a local language school in Eastbourne and maintains a blog (www.eltexperiences.com). Finally, Martin is now seeking for a publisher to assist his authoring of a book related to his experiences of language teaching and education in South Korea. I started teaching English as a foreign language in South Korea in December 2005 unqualified, inexperienced and totally out of my depth. As is common in South Korea, all budding English teachers require a degree in any subject and the enthusiasm to teach young learners or adults in a variety of settings. I started my teaching career teaching young learners and teenagers in a small private school in a small rural Korean village. This provided the beginnings of what is now a rewarding and interesting career. 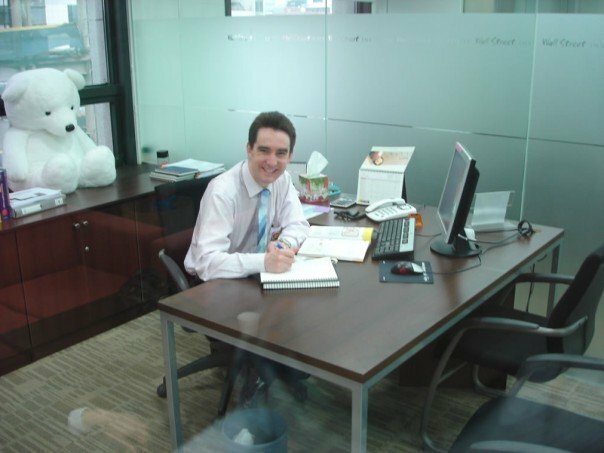 After completing one year of teaching at this small private school, I decided to commence a four week CELTA Course at the British Council in Seoul in February 2007. The rest is, as they say, history. English was initially introduced to Korea with the use of Christianity between the mid-fourteenth and early twentieth century (1392-1910). After the Japanese colonisation period of Korea (1910-1945), English was reintroduced to South Korea due to the Korean War, directly from the US Army (Shin 2007: pg.77). English Language Teaching was firmly established in South Korea within the 1990s, and prior to this, English was taught predominately by grammar translation and rote memorisation methods. However, Kim Young-Sam (a previous President of South Korea), persuaded the Ministry of Education to adopt a more “communicative English curriculum” (Shin 2007: pg.77). There has been slow change to adopt the ‘communicative approach’ of English language teaching, now commonly referred to as Communicative Language Teaching (CLT), inasmuch that the current President, Lee Myoung-bak, when he first came into power, asserted that the teaching of English should be in English so that Koreans are able to “communicate with Americans” (Shim 2009: pg.106). Consequently, this has implications for not only Native English Teachers (NETs) but also Non-Native English Teachers (NNETs). There is an expectation, due to current political pressure and the recent educational reforms, which encourage NNETs to teach English in their L2. Furthermore, these recent changes urge the Ministry of Education to implement “a national English proficiency examination that concentrates on practical English” (Shim 2009: pg.107). Although educational reforms have been implemented by the Korean Government, a study in 2006 reported that South Koreans spent an annual $15.3bn on private English lessons and $752m on tests such as the TOEFL (Card, 2006). It is believed that “incompetence in English … is claimed to have cost South Korea important business opportunities” (Song 2011: pg.36) and that Koreans have no option but to focus their financial resources to English learning. There are claims that some “parents will spend the equivalent of a month’s salary … on monthly [English] tuition” (Demick, 2002), with some parents deciding on extreme ‘linguistic surgery’ for their children so that they are “better able to pronounce” (ibid.) particular words thereby giving them a more ‘competitive edge’ in English. So how come South Koreans spend so much money on English education? Park (2009) considers the current ‘English fever1’ within South Korea is due to a Korean’s belief that education, albeit English in this case, is regarded as “the most powerful means to achieve upward social mobility and economic prosperity” (ibid. pg.50). The ‘national religion’ of acquiring English in South Korea is a big industry, with many Korean mothers pressurising their children to learn English with the belief that it obviously would improve their future employment prospects (Park 2009: pg.50). However, English in Korea is “a language hardly or never used in everyday communication” (Song 2011: pg.36) but has become an integral measurement in Korean educational performance. Type 1 teachers require a Certificate in TESOL or three years full-time teaching experience with a graduate degree in TESOL or experience and interest in Korean culture and language. Type 2 teachers only have to be native speakers of English with a bachelor’s degree in any field. The above advertisement could require Type 1 prospective native teachers, at minimum, to have ‘experience and interest in Korean culture and language’, which was my situation late 2005. However, this raises one important matter whether native teachers, without any formal background or experience in teaching or education, are the best models for English education in the Expanding Circle. Nonetheless, what is and what defines a ‘native speaker’ of English? If English is now the lingua franca, are we not all ‘native speakers’ of a variety of English? A stereotypical ‘native’ speaker of English, in the opinion of South Koreans, is an individual who is considered from the Inner Circle. Kachru & Nelson (2001) refer to a ‘native speaker’ as “someone who learned a language in a natural setting childhood as first or sole language” (ibid. pg.15). However, Medgyes (1992) noted that there is a certain amount of ambiguity by defining the native and non-native speaker (ibid. pg. 340-341). Additionally, issues arise in relation to World Englishes which question “who can be labelled a NS or a NNS because a single norm for standard English no longer exists” (Higgins 2003: pg.616). Higgins (2003) also suggests that in an attempt to move away from the native and non-native speaker model, “scholars have employed a concept of ownership to investigate speakers’ ideological stances toward English” (pg.617). There are critics to the concept of native or non-native ‘ownership of English’, stating “things will fall apart and the [English] language will divide up into mutually unintelligible varieties” (Widdowson 1994: pg.383) if there is any diversification. However, there is some hegemonic assumption that Inner Circle speakers will be communicating with Outer or Expanding Circle speakers, or vice-versa, and, furthermore, to maintain some mutual understanding, Outer or Expanding Circle speakers must employ a normative variety of English to be intelligible with Inner Circle speakers. However, pedagogically, there is a suggestion for English professionals to expose varieties of English in the ESL or EFL classroom. It is noted “that being exposed to several varieties in the classroom can help learners become aware that the success of communication with other English speakers does not necessarily rely on the [expected normative] forms of English they produce” (Suzuki 2010: pg.146). Suzuki (2010) also highlights the lack of teacher awareness, during teacher training programmes, in relation to the diversity of English and the potential effects (ibid. pg.146-151) and she recommends that preparing teachers, as well as learners, for the diversity of English would encourage understanding and appreciation of non-standard varieties of English for both the teacher as well as the learner (Suzuki 2010: pg.152-153). There is additional ambiguity, within South Korea, in classifying a ‘native’ or ‘non-native’ speaker of English, as there could be some countries which use English as an official language, such as in India or Singapore, which may be perceived with less ‘prestige’ due to their ‘endonormative’ variety of English. A news article in early July 2008, from the Philippines, stated that those eligible for a Korean E2, Foreign Language Instructor, Visa to teach English in South Korea include “the United States, Canada, United Kingdom, Australia, New Zealand, South Africa and Ireland” (GMA News 2008, www.gmanews.tv) due to their ‘exonormative’ English policy. However, a South Korean news article which was published at the end of 2008 stated that English speakers from the Outer Circle “from India and other countries that use English as an official language will be able to teach at public schools from the following year” (The Korea Times 2008, www.koreatimes.co.kr). This demonstrated that there was some recognition, from the South Korean government as well as parent groups, with particular English speakers from the Outer Circle becoming more acceptable to teach English. Does this demonstrate a greater awareness and acceptability for the diversity of English? Well it is a positive step in the right direction but, as Shin (2007) pointed out, “the NS as an ideal teacher legitimizes the substitution of language politics for racial politics in ELT” (ibid: pg.79). Shim (2002) recognised that within Korea, there was “a strong preference for American English and a unanimous unwillingness to participate in a programme that would introduce them to non-native English varieties” (in Jenkins 2007: pg.101). Card, J. (2006) Appetite for language costs S Korea dear. London: The Guardian. Available from: http://www.guardian.co.uk/education/2006/dec/15/tefl (accessed 4 April 2011). Demick, B. (2002) Some in S. Korea Opt for a Trim When English Trips the Tongue. LA: Los Angeles Times. Available from: http://articles.latimes.com/2002/mar/31/news/mn-35590 (accessed 20 April 2011). GMA News (2008) RP to Korea: Let Pinoys teach English in schools. Manila: GMA News. Available from: http://www.gmanews.tv/print/106224 (accessed 28 April 2011). Harris, R. (2005) Roadmap to Korea: Everything you ever wanted to know about the language 2nd Edition. Hollym: Seoul, Korea. Higgins, C. (2003) ‘“Ownership” of English in the Outer Circle: An Alternative to NS-NNS Dichotomy’. TESOL Quarterly, 37(4), pp. 615-644. Kachru, B. B. & Nelson, C. L. (2001) ‘World English’ in Burns, A. & Coffin, C. (eds) Analysing English in a Global Context. London: Routledge, pp. 9-25. Kang, S. W. (2008) Non-Natives Can Become English Teachers. Seoul: The Korean Times. Available from: http://www.koreatimes.co.kr/www/news/nation/2008/12/117_36881.html (accessed 20 April 2011). Kirkpatrick, A. (2007) World Englishes: Implications for International Communication and English Language Teaching. Cambridge: Cambridge University Press. Krashen, S. D. (2011) Stephen D Krashen: Dealing with English Fever. Available from: http://www.sdkrashen.com/articles/fever/index.html (accessed 22 April 2011). Medgyes, P. (1992) ‘Native or non-native: who’s worth more?’ ELT Journal, 46(4), pp. 340-349. Park, J. K. (2009) ‘‘English fever’ in South Korea: its history and symptoms’. English Today 97, 25(1), pp. 50-57. Shim, R. J. (2002) ‘Changing attitudes toward TEWOL in Korea’. Journal in Asian Pacific Studies. 12(1) in Jenkins, J. (2007) English as a Lingua Franca: Attitude and Identity. Oxford: Oxford University Press. Shim, R. J. 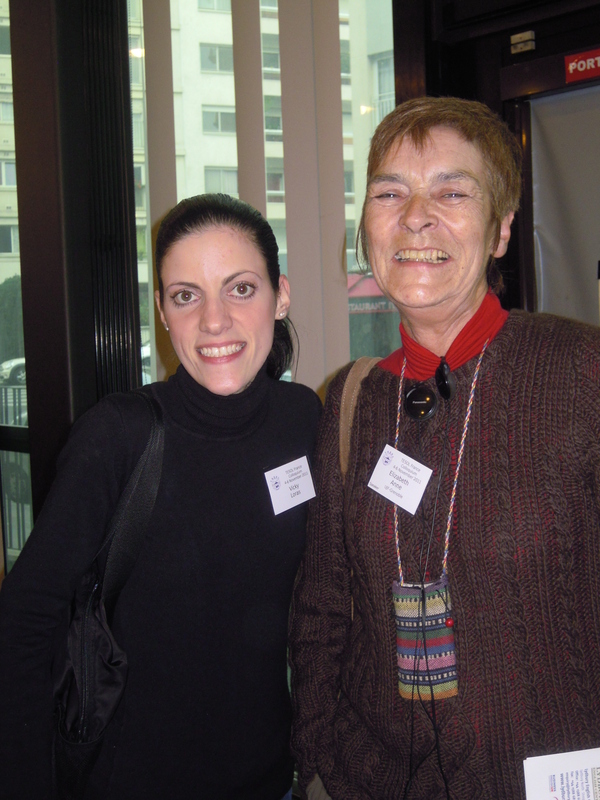 (2009) Plenary: Empowering EFL students through teaching World Englishes in IATEFL 2008: Exeter Conference Selections edited by B. Beaven, April 7-11 2008. IATEFL: Kent. Shin, H. (2007) ‘English Language Teaching in Korea: Toward Globalization or Glocalization?’, in Cummings, J. & Davison, C. (ed.) International Handbook of English Language Teaching. Springer: New York, pp. 75-86. Song, J. J. (2011) ‘English as an official language in South Korea: Global English or social malady?’ Language Problems & Language Planning, 35(1), pp. 35-55. Suzuki, A. 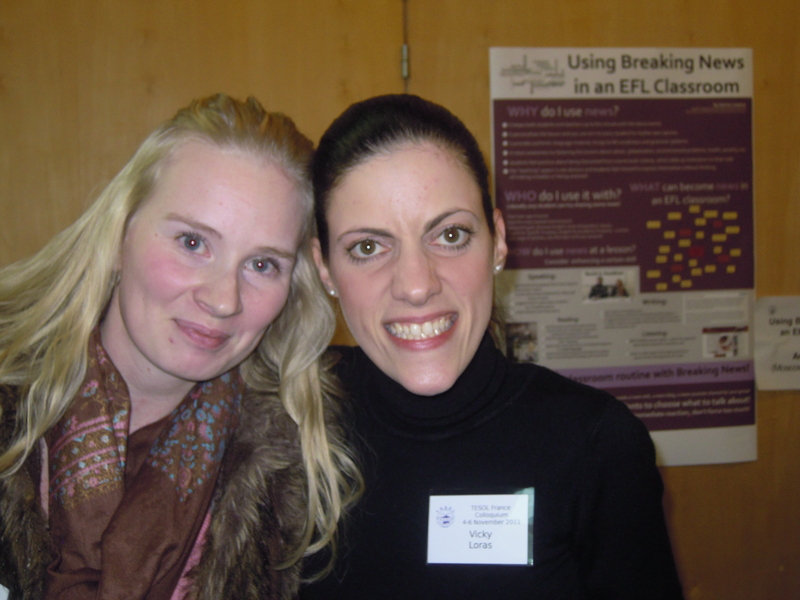 (2010) ‘Introducing diversity of English in ELT: student teachers’ responses’. ELT Journal. 65(2), pp. 145-153. Widdowson, H. G. (1994) ‘The Ownership of English’. TESOL Quarterly, 28(2), pp. 377-389. 1 ‘English fever’ was a term coined by Krashen in 2003. It is used to suggest an “overwhelming desire to (1) acquire English, (2) ensure that one’s children acquire English, as a second or foreign language” (http://www.sdkrashen.com/articles/fever/index.html, 2011). English education in South Korea has also been referred to as a ‘national religion’, a ‘craze’ or has a ‘cult-like status’ (Harris 2005: pg.172). And after two fantastic days of learning and connecting, the third day arrived which was equally super! There was only one difference though…we were all feeling sad at the end of it, because we would have to end a great conference and say goodbye to very good friends. 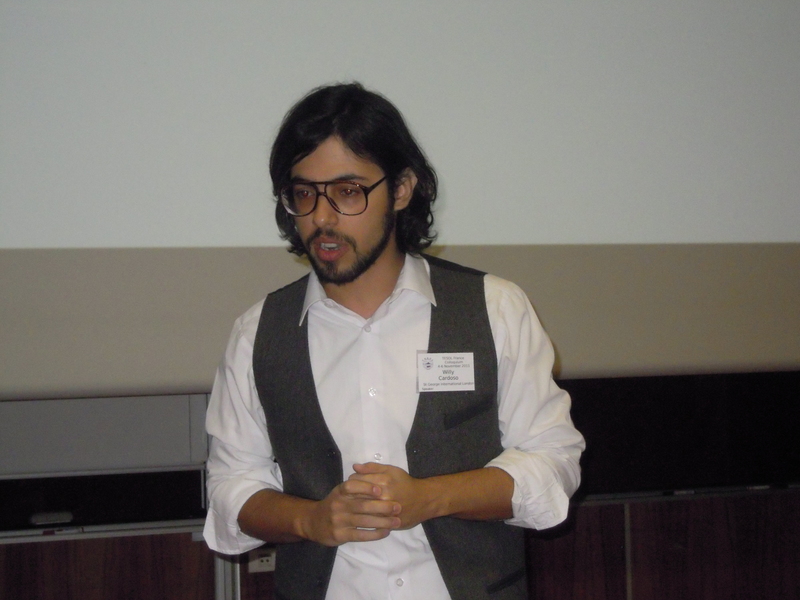 The third day started off with a session by Willy Cardoso, Classroom Management – Who’s (Really) in Charge? It was the first time I had attended a talk by Willy. I am a big fan of his blog, Authentic Teaching – if you have not read his posts, I would highly recommend them! I absolutely loved Willy’s talk. 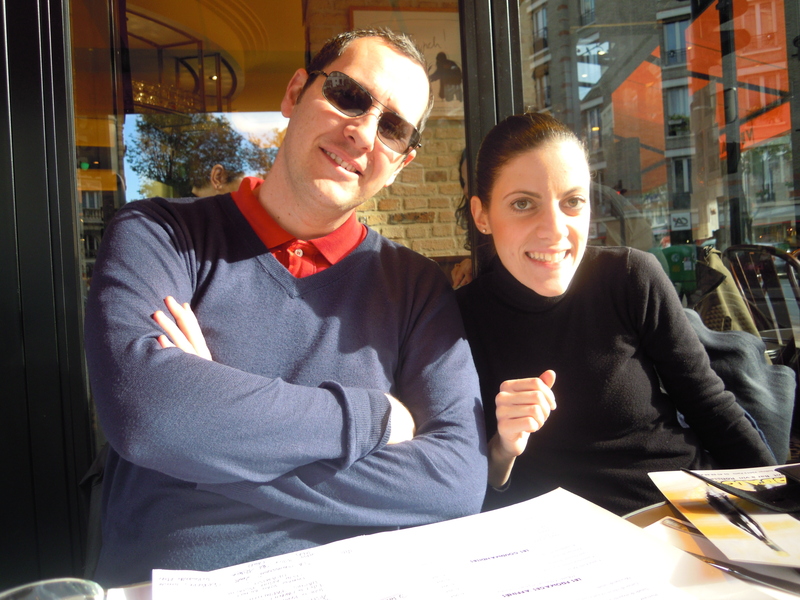 He shared his personal experiences in class with his students in London – Willy told us of how he gave his students ownership of the lessons. They felt comfortable enough to ask him to do something particular they liked in the next lesson and it worked – Willy had the greatest of lessons with them! They were still learning. He also spoke of seating arrangements that he changes all the time according to what he wants to do with students in class. I wish I could have seen one of Willy’s lessons! 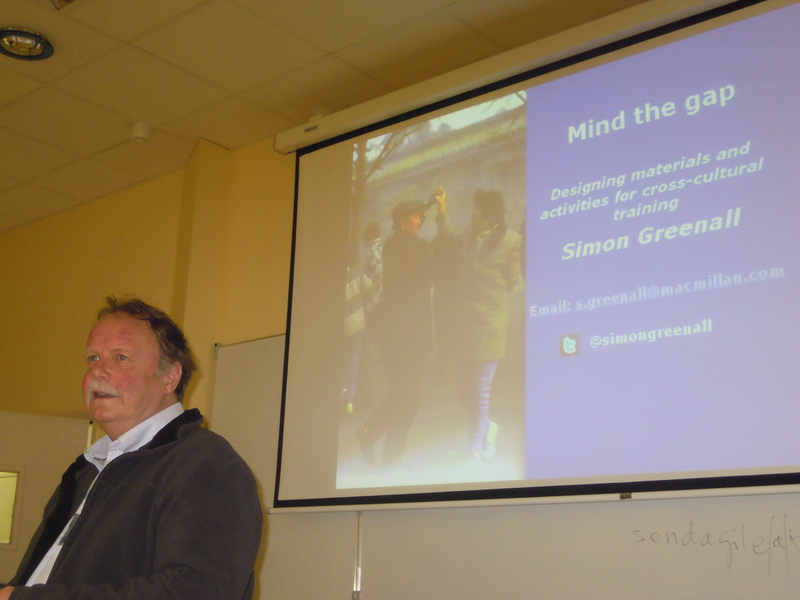 After that, I had the privilege of attending the talk of a person I have admired for years for his work, and have had the good luck of meeting personally – and is a fantastic person as well – Simon Greenall! Simon talked about a subject very close to my heart, that of culture and diversity, which I have mentioned many times in the past as an integral part of my teaching. In his talk Mind the Gap: Designing Materials and Activities for Intercultural Training, Simon spoke to us about how he has integrated culture in his books and materials – the sensitivity we should have towards people of various cultures in our teaching, in order to pass this on to our students and show them that these cultural differences are important, in order to bring tolerance in our classes. Another one of my favourite people on Twitter was up next – Arjana Blazič and her workshop Testing, testing, 1 , 2, 3! Arjana is a multi-awarded educator from Croatia with two blogs: her own and one she has organised with her IT specialist at school to help students in their Matura exams. Arjana, who integrates technology extensively in her classes, introduced us to a multitude of web tools in order to help our students with quizzes and online testing. The great thing was that on these websites teachers and students can be very flexible and create quizzes of their own. Arjana did a great job of pointing out the advantages and disadvantages of these web tools, which ones we could use free of charge and which we have paid versions of. You can see her presentation and all the slides including all the web tools on her blog. The conference closed with a fantastic plenary by Geoff Tranter, called That’s a Funny way to Learn a Language! Geoff has an amazing sense of humour (which he also showed us during the Open Mic night the evening before) and demonstrated how we can use it in class effectively – he showed us funny acronyms, riddles, funny signs and newspaper headlines we can use in our classes! I liked what Geoff said at one point: If your students are making humorous remarks in a foreign language, you have come a long way with them. I really enjoyed this closing plenary, as it was full of tips and also quite different. 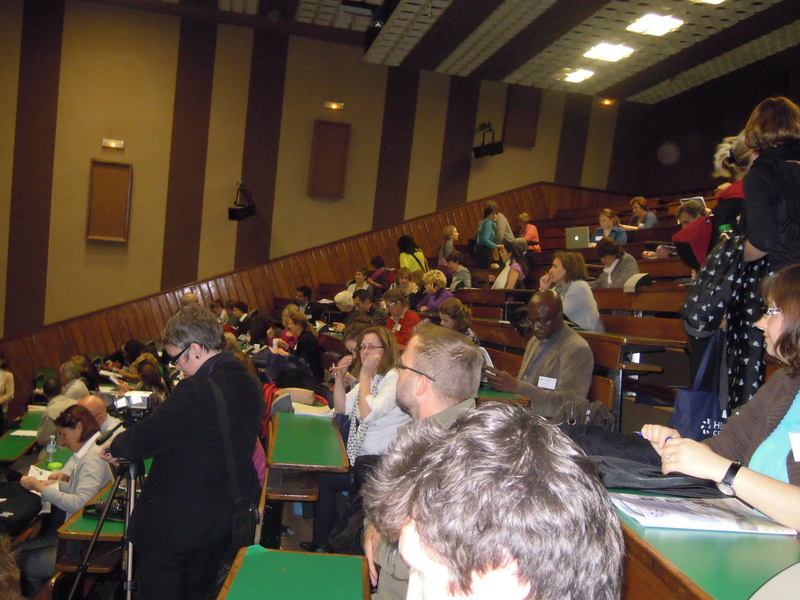 After the conference, the BESIG weekly workshop, with Helen Strong this time, was broadcast in the amphitheatre – some watched it, some of us had to leave Paris unfortunately, and a great conference and very good friends behind. 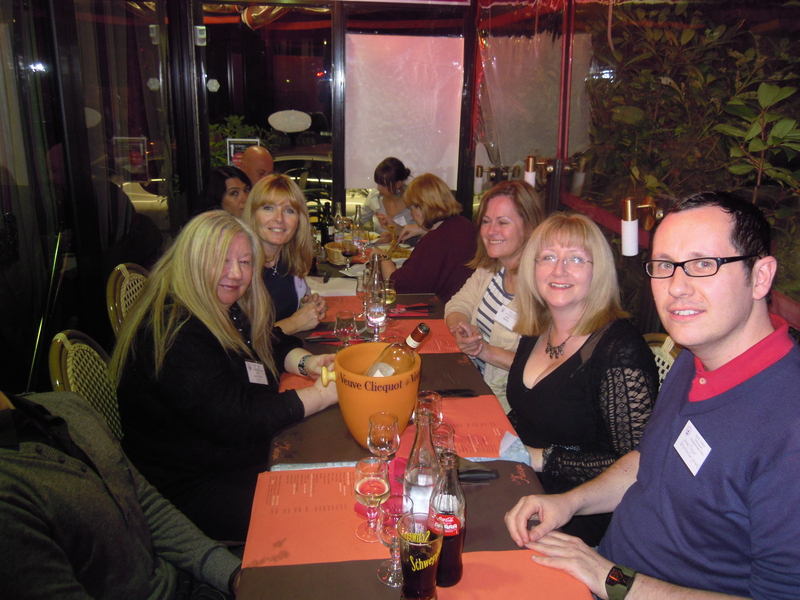 As a closing treat to these three posts about the respective days of the TESOL France conference, I have some photos for you! I hope you enjoy them. A restaurant full of tweeters! 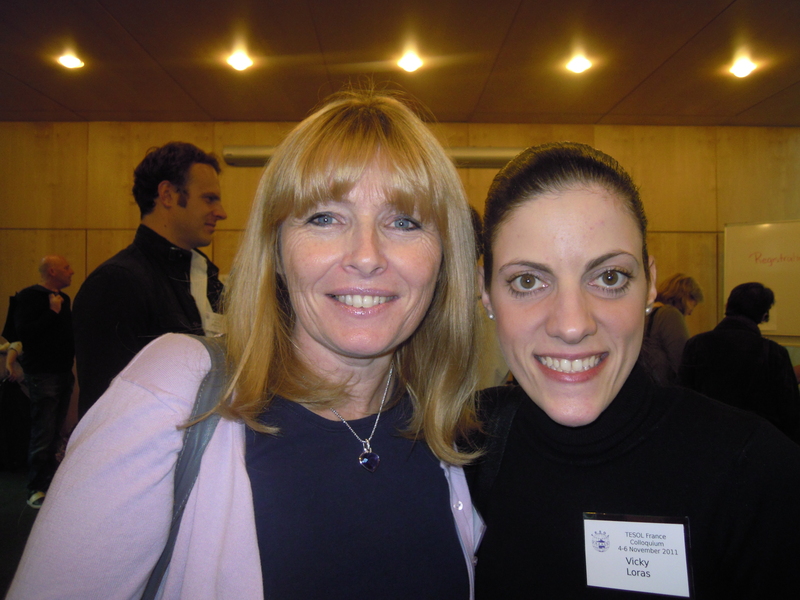 I have the great honour to present my new guest blogger to you – a wonderful educator from Crete, Greece: Christina Markoulaki! I have connected with Christina on Twitter and hope one day to meet her face-to-face. She is an enthusiastic teacher and blogger and also an iTDi Associate. Thank you so much for your fantastic post, Christina! Proudly showing our carefully arranged cards! The students who start their journey in the English language are always very happy to make their very own alphabet cards. All they need is some cardboard paper (or any colored paper) cut in small square pieces and their crayons. On one side of the card, they can write the letter in uppercase and lowercase, while on the other they can write the word that begins with that letter and draw a picture of the word. 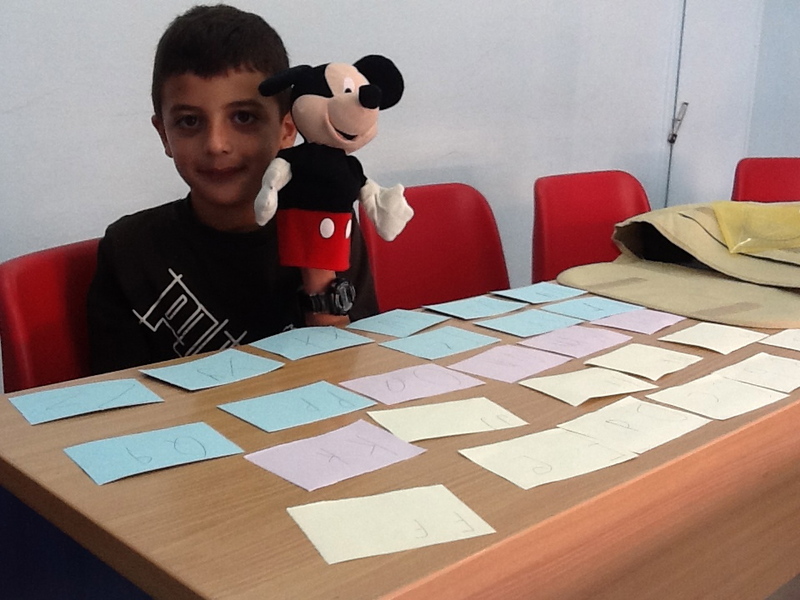 This activity does not take considerable classroom time and is always welcome by the children. Mickey can join in the fun, too! As soon as the cards are prepared, the games that can be played with them are endless! The ones that never fail to excite my students are ‘Find the letter/ word’, ‘Form the word’, You are the Teacher’ and, of course, ‘Letter Bingo’. 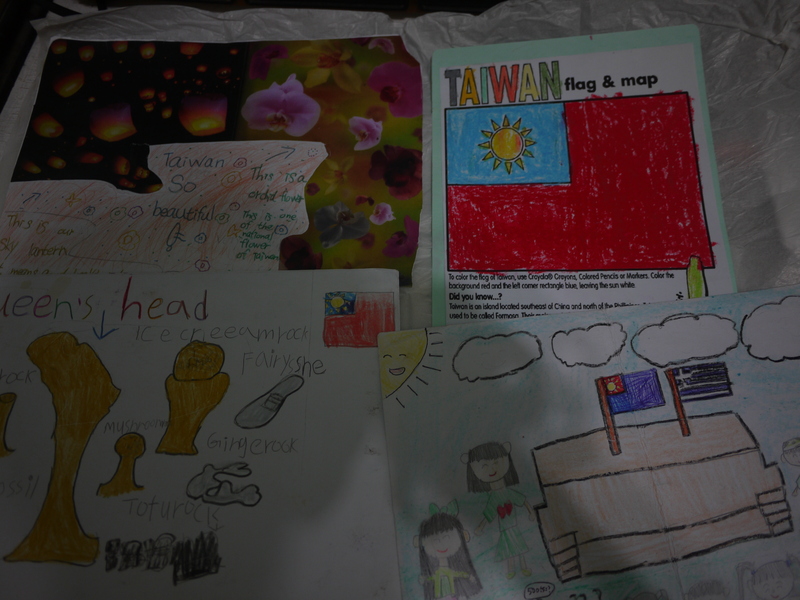 Judging by the names, it can easily be understood that the first games are a product of my inspiration during a cheerful lesson with the juniors, while the last one is well-known worldwide. Students can be divided in groups before they have a go at these games and learn how to collaborate from an early age. Each group can win points for each correct answer it gives, which makes things even more suspenseful! In the first game I mentioned before, the teacher pronounces a word or a letter and the learners have to pick up the correct card as quickly as possible. 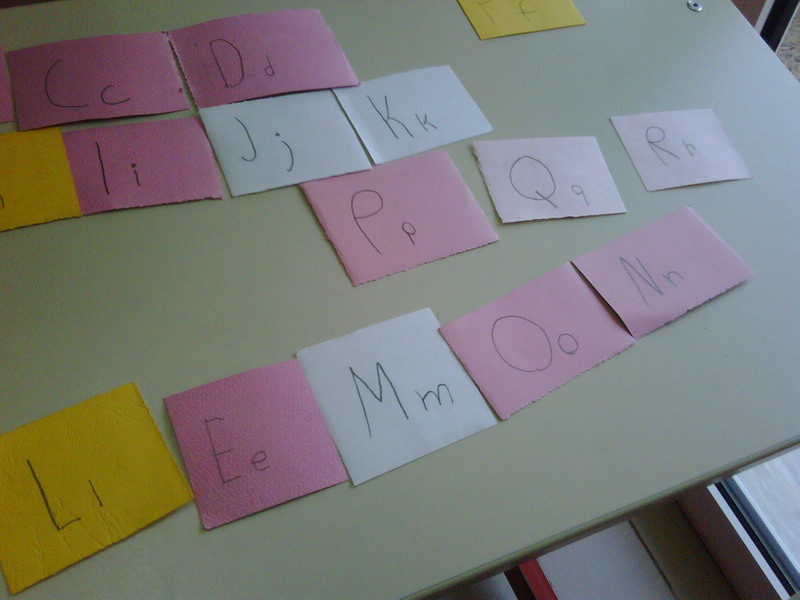 In the second one, they need to form the word they hear using the cards in front of them and in the third case they are allocated the teacher’s role, now having the opportunity to test their classmates’ knowledge of the alphabet by asking them to raise the card of the letter or word they utter. The final activity is exactly the same as the popular Bingo game, but involves the use of letters, not numbers. Based on that, the students have to choose their favorite six (that is the usual number of cards allowed in my classes) letters/ words and have the cards depicting them laid on the desk. While the teacher (or another student) pronounces random letters or words, the players remove the letter they hear in case this is depicted in one of the cards they decided to keep in front of them. The first player (pair/ team) that has no cards left can happily exclaim ‘Bingo’! Admittedly, this is everyone’s favorite part of the game and can be heard from time to time even from passionate players who have not won! Are your students bored with grammar rules and formulas? Turn everything into a train and they will love it! The inspiration for such a venture came after attending a seminar, where a quite similar idea was presented, but I decided to develop it a bit further and design my own wagons on my computer. This allowed me to visualize any grammar rule I wanted as well as include some funny figures in each wagon (famous people, cartoons or colorful pictures) to give the learners something more to be excited about! The idea is rather straightforward: you can design a wagon on your screen on a Word or Pages document by placing a rectangular shape on top of several circles which serve as the ‘wheels’ of the train. Needless to say, you could simply use a readily made picture of a train and paste the grammar parts on it, as I have done in order to create the first, and most impressive, wagon; that which contains the subject of the clause! 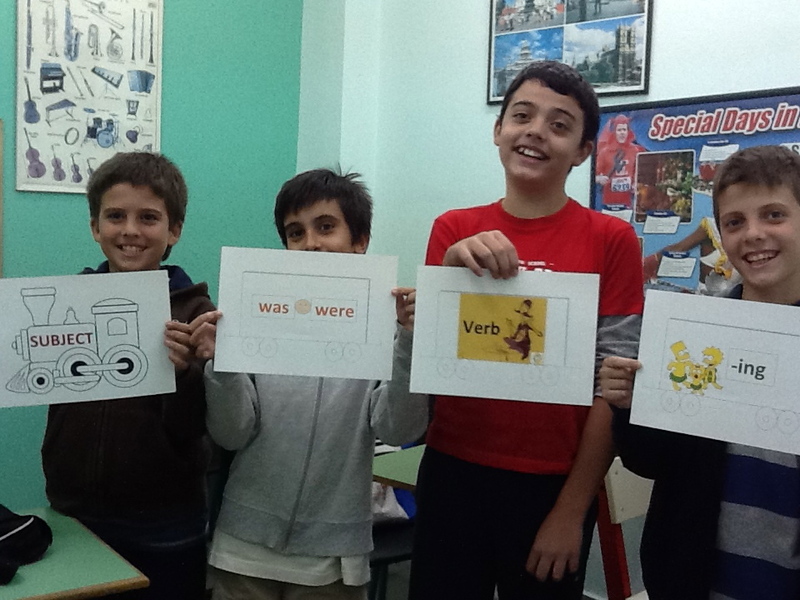 The whole activity can be extremely amusing, apart from educational, since the students need to change positions to rearrange the parts of each tense if they want to form the affirmative, interrogative and negative versions of it. Once again, the students can be divided into groups which should coordinate to quickly form the tense the teacher dictates. Imagination poses no limits! Feel free to apply these ideas in your classroom and let me know how the experience was. 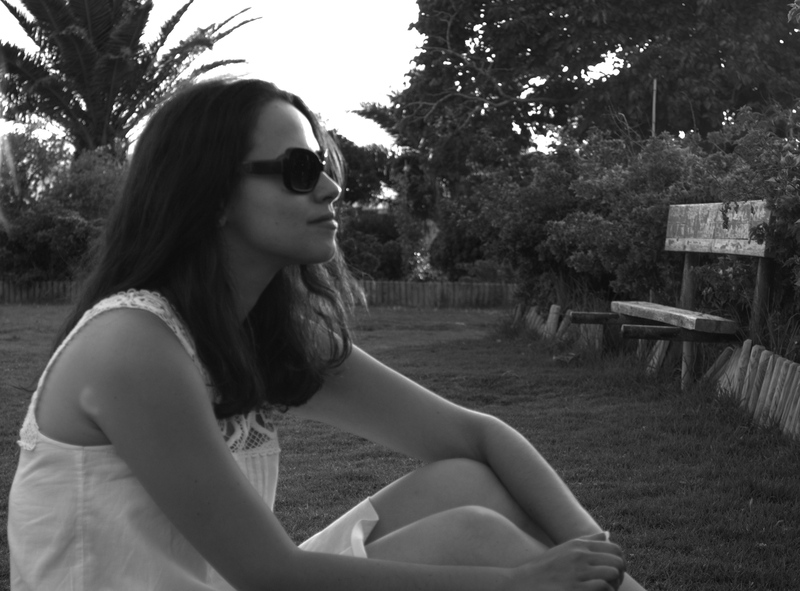 Christina Markoulaki is an EFL teacher in Greece, where she was also born. She is fortunate enough to have been trusted with students of all ages and levels within her 5 working years, their ages ranging from 5 to 50 years old! Using modern technology in the classroom to create new learning experiences is what fascinates her. All links concerning the school she works in can be found on this colourful glog!